You’ve tried running and spinning. You’ve sampled every aerobics class variation and every possible version of the step machine. What else can you do to get that cardio fix? Suggestion: Put up yer dukes. To get started, try this simple suggestion from Navin: “Go back and forth from body-weight squats—20 reps per set—to punching the heavy bag for 20 seconds. This will get your heart rate up and allow your body to work at a higher rate, even at rest. You may then want to step up to a high intensity interval training (HIIT) program. “If it’s tone, slimming, losing weight or even increasing muscularity, boxing drills can boost any program with significant results,” Nandalall declares. • 5-minute warm-up with jump rope: “It doesn’t matter if you trip, get to 5 minutes,” he says. 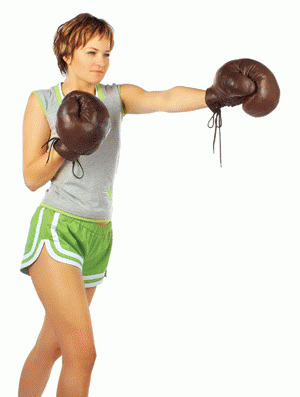 • Next: Left-right (1-2) punching combination on heavy bag for one minute then jumping rope for one minute. Rest for one minute and repeat this cycle 5 times. 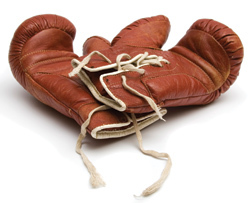 • Move on to 4-punch combo punching on bag (left jab/right cross/left straight/right hook) 30 seconds on, 30 seconds off. Repeat 4 times. • If you have access to a double-end bag for eye/hand coordination, go with 30 seconds of punching/push-ups to failure/abdominal crunches to failure. Rest for one minute then repeat 4 times.